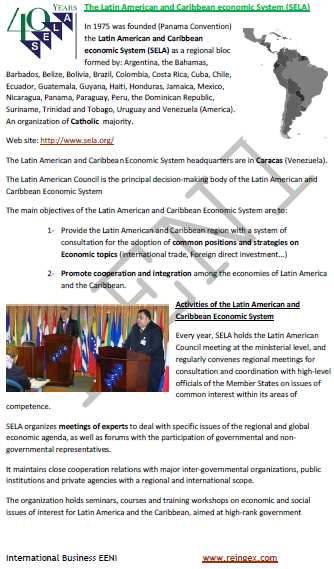 Syllabus of the Online Course (Subject): Latin American and Caribbean Economic System (SELA). In 1975 was created the Latin American and Caribbean Economic System (SELA), by the Panama Convention, as a regional economic bloc formed by Argentina, the Bahamas, Barbados, Belize, Bolivia, Brazil, Colombia, Costa Rica, Cuba, Chile, Ecuador, Guatemala, Guyana, Haiti, Honduras, Jamaica, Mexico, Nicaragua, Panama, Paraguay, Peru, the Dominican Republic, Suriname, Trinidad and Tobago, Uruguay, and Venezuela (America). The Latin American and Caribbean Economic System (SELA) belongs to Latin American Economic Area (Western Christian Civilisation).